St. Basil the Great. Public domain image from Hagia Sophia Kiev, 11th century. 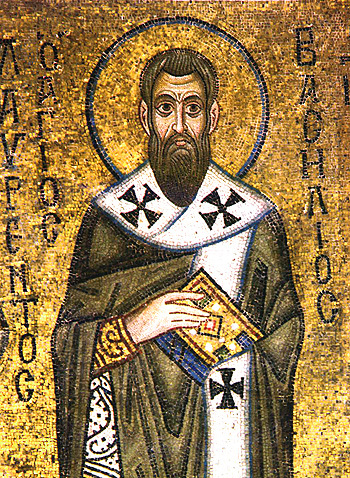 Today we commemorate Saint Basil the Great who ranks among the Cappadocian fathers of the 4th century: Basil the Great, Gregory of Nyssa, Gregory Nazianzen whose feast day is also today; and we must not forget Macrina, the older sister of Basil and Gregory of Nyssa who ranks among them as well because of her keen theological insight. They advanced the development of Christian theology as expressed in the Creed of Nicaea. This entry was posted in Christianity and tagged Basil the Great, Cappadocia, Gregroy Nazianzen, Macrina, Nicaean creed on January 2, 2017 by frjfkauffmann.